8th-generation Toyota Hilux, overall. Toyota’s revered luxurious pickup truck was revived in Japan 13 years after demise. Pickup trucks. They’re one of the most-recognized vehicle categories around the world, and they’re the major players in Americas, Oceania and Southeast Asia, as well as a climbing category in Europe. However, they’re an already-extinct vehicle category in Japan, with all vehicle models have been axed off JDM from 1990s to 2004. The preference for station wagons and cab-over vehicles, the hatred for pickup trucks, combined with the incompatible regulations in Japanese laws, have contributed to the extinction of pickup trucks in Japan. Therefore, the body style has fallen into obscurity among general Japanese buyers’ knowledge. 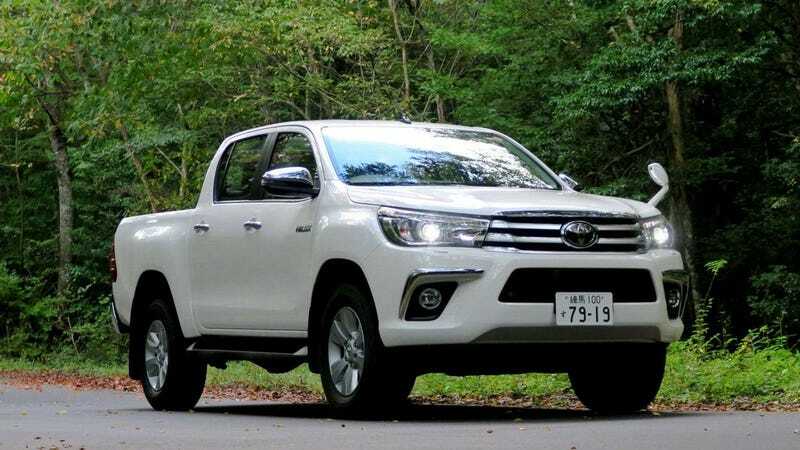 However, the 2017 revival of Toyota Hilux, a most-revered, luxurious pickup truck even in Japan before its 2004 demise, could mark the beginning of pickup truck revival in Japanese Domestic Market. The order list is more than expected, from the old owners and the diehard fans of the famed pickups. SUVs and minivans, which almostly pushed off station wagons in JDM, could pave more driving force for these bonnet-type trucks. With Toyota Hilux being revived in JDM, we might have a look on some Japanese-branded foreign-market pickup trucks having any chance of entering Japanese market. 3rd-generation Nissan Frontier/Navara, post-Datsun Trucks era. A pickup truck made by Nissan for most parts of global markets, the truck has now been in its 3rd generation D23 series. Even though the preceding D40 series is also sold in USA, it’s not sold in Japan, much to the surprise. However, given Mercedes-Benz’s good popularity in Japan, the D23 will get sold as its Mercedes-Benz X-Class luxury disguise other than its standard NP300 model. Predecessor: The Nissan Datsun Truck series, got phased out since 2002. The preceding Triton was sold as a limited-edition vehicle in Japan from 2006 to 2011. The new generation Triton is not sold in Japan for now, but with the concepts and prototypes paving roads for hybrid models in the future, this would be a possibility for the Triton to return In Japanese market, although the future for the pickup truck market in Japan remains to be seen. 2nd-generation Isuzu D-Max, post-Rodeo era. Sometimes called Rodeo, it’s sold in some parts of Europe, Asia, Africa and Oceania, but since Isuzu quit the passenger vehicle market long ago, they have no plans for the pickup trucks to be sold in JDM, even though they’re premired for Tokyo Motor Show years ago. The chances for D-Max to get into JDM is very shallow, compared to the above two. Predecessor: Isuzu Rodeo, who was killed off in 1994 in JDM. 2nd-generation Mazda BT-50, post B-series era. The less-known pickup truck made by Mazda, the truck is sold in South America, and parts of Asia as well as Australia, but it’s not sold in Japan. There are zero-chances of making it to the Rising Sun Land, given its global obscurity. Predecessor: Mazda Proceed, who was killed off in 1999 in JDM. Honda’s first bonnet-type pickup truck, it’s sold in North America for the Honda buyers who wanted a pickup truck. This is a cool truck from Honda, but given Honda’s lack of experience of making such types and lack of awareness on the category, no chances will Ridgeline be go JDM, even though the NSX hybrid sports car is also made in USA, for Japanese consumers ironically. With the Hilux being revived in Japan, this paved the road for the revival of bonnet-type pickup trucks in Japanese Domestic Market. Although they’re treated the worst in Japan, the strong sales of crossover SUVs and off-roaders, as well as global boom, have driven the contribution of bonnet-type truck revival. Even though the future of pickup trucks are uncertain in Japan, the diehard fans are also giving the bonnet-type trucks another Japanese chance. Time will tell if the pickup trucks will become a new boom again.